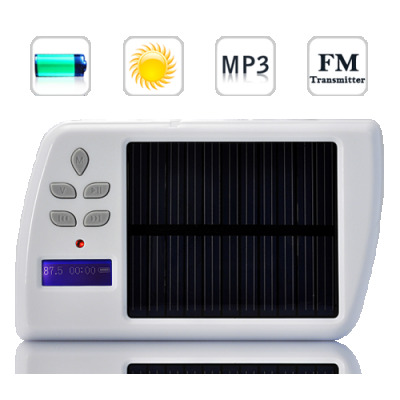 Successfully Added Portable Solar Charger + MP3 Player+ FM Transmitter to your Shopping Cart. Introducing the Portable Solar Charger + MP3 Player+ FM Transmitter, your perfect companion for charging cell phones and USB devices inside your car, at the airport, on vacation, in remote locations or in emergency situations. Wherever you go, take this solar charger with you. You can use it anywhere where the sun is visible, which is everywhere on the earth, and even in outer-space! The included multiple adapter tips will both power and recharge your various electronic devices. So you can talk more, listen to more great music, and just be the coolest hipster you can be. It only takes a few hours to charge, but with its built-in 1200 mAh battery, you'll get endless amounts of juice for all your communication, entertainment, and productivity needs. Furthermore, you can save your favorite music on the charger and enjoy your music wherever and whenever you want to. Additionally, this product supports up to a 32 GB micro SD card (free 2GB included) to store all your favorite music, take them with you wherever you go! More importantly, all audio from these devices can be transmitted to FM radio speakers! How will that improve your life? FM Transmitters allows you to stream communication and entertainment directly to your car's speaker system by means of your car radio's FM receiver. Basically you'll be able to listen to your music or hear your caller through the car speakers. Great for callers who talk real softly. You have dreamed about this amazing item and now the dream has come true! What are you waiting for? Get this solar charger for yourself, your homies, or your customers. Stocked in our warehouse for immediate order fulfillment and worldwide shipping to any destination, whether it's you or your customer. Brought to you by the leader in factory-direct hi-tech gadgets, Chinavasion.